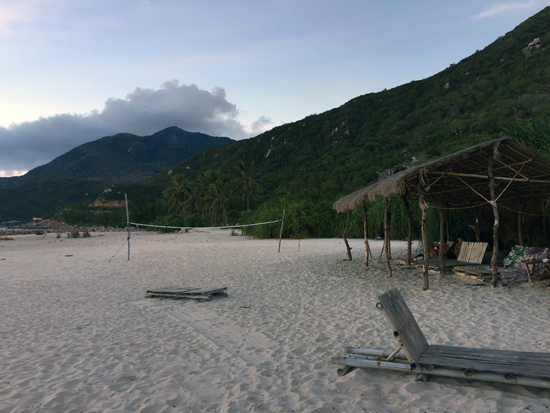 Fifty kilometres north of Nha Trang lies Doc Let, a quiet eden of palm-fringed, powdery white sand, sparkling azure waters and a sleepy disposition. Despite its resounding beauty, relatively few people venture here and the beach still feels low-key, natural and wild. If you don’t have the time to stay here (and you really should), then it is well worth doing it as a daytrip. 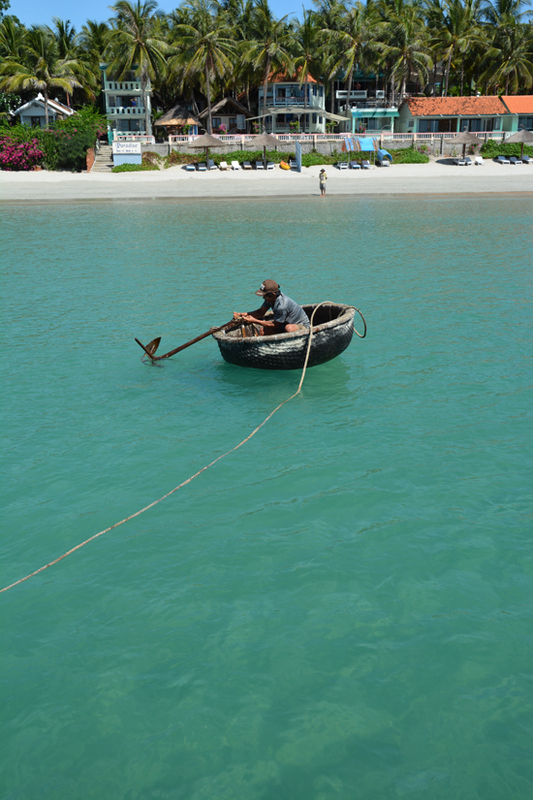 Hire a car, rent a motorbike or take the cheap air-conditioned public bus that drops you right at the beach. Doc Let Beach – sometimes spelled Doc Lech, and actually pronounced “yop lek” – is an idyllic stretch of coast ended by a rather unsightly Hyundai shipping port. There are only a few places to stay on Doc Let and they are spread out. We suggest heading to the beaches in front of the resorts to enjoy the patch of rubbish-free sand. On your own wheels from Nha Trang, the most direct way is to head north on National Route 1 (Quoc lo 1, or abbreviated as QL 1) to Ninh Hoa, approximately 38 kilometres from the city centre. (Random fact: popular Vietnamese dish nem nuong, grilled pork wrapped in rice paper, originated from Ninh Hoa). Head east on QL 26B to get to the very isolated southern end (Ninh Tinh village, Jungle Beach). Veer right onto DT652B/TL 1 which will take you to Doc Let, where there is more local civilisation and activity. Either spot you choose, prepare to laze away the day. 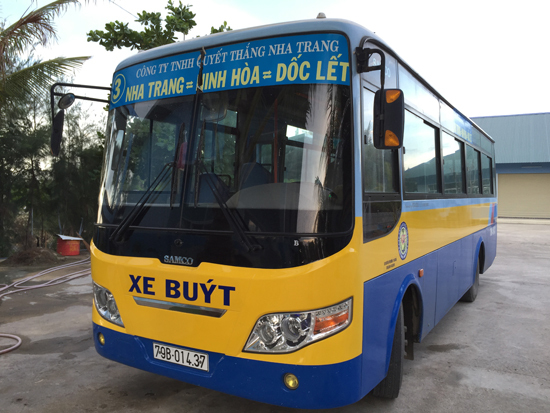 From the tourist centre, on Nguyen Thien Thuat Street take the blue-white-yellow air-conditioned bus #3 (Nha Trang – Ninh Hoa – Doc Let). Bus starts at 06:30, costs 24,000 VND per ride, and last stop is at the beach beside White Sand Doclet Resort & Spa. The ride takes about 1.5 hours one way. Last bus departs at 17:30 sharp. For a one-way journey, we were quoted 500,000 VND for a taxi. If you want roundtrip, having the driver stay for the whole day and/or drive you to different spots, you’ll have to negotiate accordingly. The #3 bus to Doc Let is a budget traveller’s friend. You can park your bum anywhere on the beach for free, or White Sand Doclet Resort & Spa has a well set up day guest area with rentals: admission 35,000 VND, locker 15,000 VND, hammock or sun bed 25,000 VND, beach tent 150,000 VND or picnic “cottage” with table and loungers 170,000 VND. Facilities include toilets and showers. Rent a picnic hut at White Sand Resort & Spa. If you have your own transport, we highly recommend heading to Paradise Resort. Not only is the swimming here idyllic and sigh-worthy, the view to the hills, archipelago and fishing boats are equally stunning. In this area you can also walk around small Dong Hai village to explore the local scene. The 89-year-young amiably eccentric owner of Paradise Resort invites daytrippers to have lunch at the resort for only 150,000 VND per person. The lunch is tasty and filling, with coffee, tea and vodka included – and all tables have a bottle included in the tray of condiments. To get there, follow the signs to its neighbour Some Days of Silence Resort. The beach at Paradise Resort, which lives up to its name. 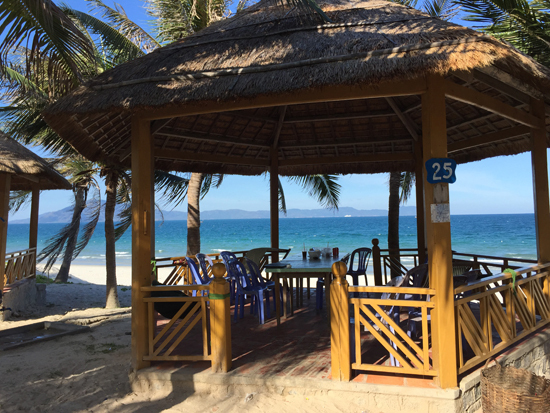 Nineteen kilometres south of Paradise Resort along the coast, about a 30-minute drive from Doc Let, is Ninh Tinh village, home to Jungle Beach and its chilled out, jungle-y, ultra rustic accommodation. If you’re visiting for the day, you can relax in a hammock, gather others for a game of volleyball or just do nothing. While their website says “Pay for what you eat, Pay for what you drink, Enjoy the rest for free! !” there was a complaint online about an entry fee. It seems it could change on a whim. You’ll either love or hate Jungle Beach. Those who love it end up staying here for longer than anticipated… If you want to linger for the whole day or stay for their beach bonfire and barbecue, it’s best to go by taxi round trip than drive a motorbike in the dark. They can call a taxi for you but since you are miles from anything and the closest village is far away, it will cost you.